Till date, the only consistent description of the deconfinement phase of the Sakai-Sugimoto model appears to be provided by the analysis of . The current version of the analysis, however, has a subtlety regarding the monodromy of quarks around the Euclidean time circle. In this note, we revisit and resolve this issue by considering the effect of an imaginary baryon chemical potential on quark monodromies. With this ingredient, the proposal of  for investigating finite temperature QCD using holography is firmly established. 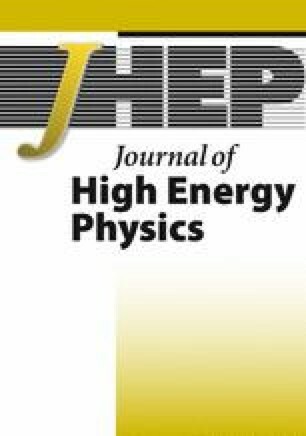 Additionally, our technique allows a holographic computation of the free energy as a function of the imaginary chemical potential in the deconfinement phase; we show that our result agrees with the corresponding formula obtained from perturbative QCD, namely the Roberge-Weiss potential. J.M. Maldacena, The large-N limit of superconformal field theories and supergravity, Int. J. Theor. Phys. 38 (1999) 1113 [Adv. Theor. Math. Phys. 2 (1998) 231] [hep-th/9711200] [INSPIRE].